He made the accusation in a tweet. Conservative Leader Andrew Scheer rises during question period in the House of Commons on Parliament Hill in Ottawa on June 20, 2018. 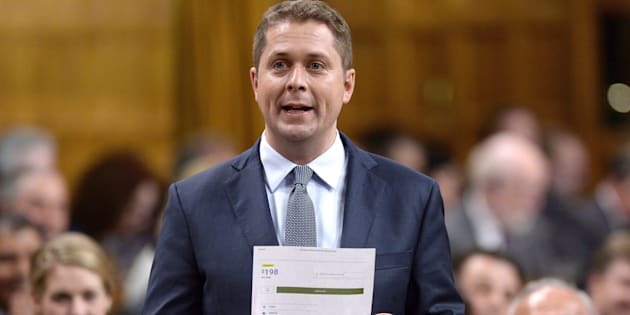 In a tweet this week, Scheer took aim at Justin Trudeau's record since 2015, arguing the prime minister "inherited a booming economy," but is "squandering it" through "uncontrolled spending and tax hikes." His tweet added a graphic noting a net loss of 17,000 jobs in Canada so far this year, compared to almost 1.3 million created in the United States. So has Trudeau turned a roaring economy into slow simmer? This one earns a rating of "a lot of baloney." Here's why. The Liberals took power in November 2015. The Canadian economy saw two consecutive quarters of contraction at the start of 2015, meeting the definition of a technical recession, before showing some growth again. Canada's economy ended the year with real GDP growth of one per cent. World Bank figures show growth in subsequent years was 1.4 per cent in 2016 and three per cent in 2017. The Bank of Canada estimated in its July monetary policy report that the Canadian economy would grow on average annually by two per cent between 2018 and 2020. Prime Minister Justin Trudeau, left, shakes hand with Conservative Leader Andrew Scheer at the start of the Defi Pierre Lavoie, a 1000-km bicycle trek, on June 14, 2018 in Saguenay Que. The Liberals promised to run deficits of $10 billion in each of their first two years to finance infrastructure work to prod economic growth, but have blown past those spending promises while increasing taxes for higher income earners and cutting them for others. Statistics Canada data show a recent decline in the number of people employed in Canada. Employment fell by 17,100 positions between the almost 18.63 million recorded in June 2018 and the almost 18.65 million in December 2017. In the United States, Bureau of Labor Statistics figures show an total increase of 1.29 million jobs between January and June. The economy in 2015 was hurting from plummeting commodity prices beyond the control of the previous Conservative government, said Randall Bartlett, an economist with the Institute for Fiscal Studies and Democracy at the University of Ottawa. The economic rebound in 2017 was largely linked to a rebound in oil prices, he said. "That was not inheriting a booming economy, quite frankly. The economy was not doing well at all." As for Scheer's claim that Trudeau's reckless spending undermined Canadians' prosperity, economists say some kinds of government spending are more supportive of growth than others. The economy was not doing well at all. Infrastructure, for instance, has a far-reaching multiplier effect, both in the short term and in the long term, said Brenda Spotton Visano, a professor of economics and public policy at York University in Toronto. "I have no problem paying taxes if I am confident in the government's decision on where to spend it," she said. Charles Lammam, director of fiscal studies with the Fraser Institute, warns it would be a stretch to link any immediate changes in the country's economy to the actions of one government. The federal budget is "a drop in the bucket" relative to the size of the economy, he says, but adds governments "can affect the economic environment through their policies at the margins." Sheila Block, a senior economist from the Canadian Centre for Policy Alternatives, issues a similar warning about comparing Canadian and American job figures: There are slight differences in methodology, and the size of the U.S. economy means its jobs figures will be larger than Canadian numbers. Block says since November 2015, when the Liberals took office, the country has added about 642,000 jobs. The jobs figures between December 2017 and June 2018 are a unique reference period zeroing in on an employment decline, Block said. "Comparing just one month without looking at it in context...you're kind of cherry picking a number," she said. Economists are in general agreement that Canada was not roaring in 2015, but differ on the impacts of Liberal policy. The math on the job figures is factually correct but lacks context. Scheer's tweet overall has "a lot of baloney." There are signs, though, that the Liberals should not take the current economic climate for granted. Slowdowns in business investment, uncertainty about trade, and concerns about household debt as interest rates rise are among the red flags Canada may be on the downside of the economic cycle. "I'm worried about our economic prospects," Lammam said. "I don't particularly think there is anything to cheer about based on the 2017 numbers because the fundamentals don't show a good and strong long-term economy."